In this guide I'll show you exactly where to find each of the parts for the Dragon Shield (zombie shield) in Gorod Krovi. As you probably know, the zombie shield is one of the most popular builables in Treyarch's zombies game , simply because it offers unparalleled protection from rear attacks, making it the perfect compliment to the Juggernog perk. The zombie shield has seen quite an evolution in Black Ops 3. What started as a simple riot shield has now become more than just a piece of protective equipment. In Shadows of Evil the shield had a "charge" feature which was driven by rocket fuel. In Zetsubou no Shima the shield could be electrified following a lightning strike on the the ritual site. Now with Gorod Krovi, players actually have a fully offensive shield that shoots green fire to kill nearby zombies. The shield also plays a significant role in protecting the player from the many dragons flying round the map. It's a good choice to have the shield built as early as possible to safeguard against the dragons fire attack; which occurs both as timed events in certain locations on the map but also whenever a player initiates a "Dragon Strike". 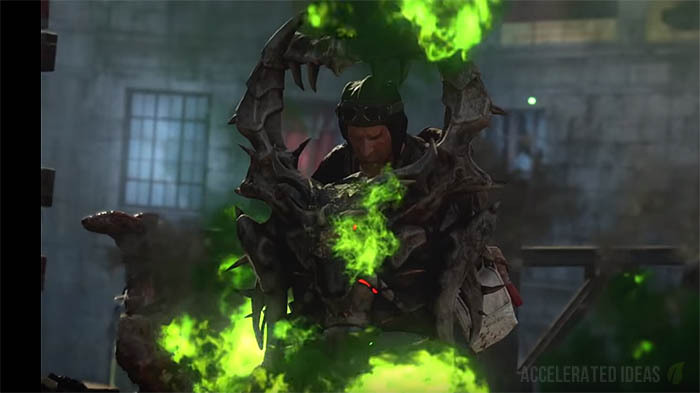 As with the Ray Gun Mark 3, Treyarch have decided to rename the zombie shield to the Dragon Shield, mainly because the shield does offer massive protection from dragon fire attacks. Ok, down to business. The instructions below will guide you on your way to finding each of the three parts required to build the zombie shield on Gorod Krovi. Players should note that Part 1 and Part 3 are on opposite sides of the bridge and you can reach both of these from the Department store. Part 2 is the easiest to find, either near Jug or the Operations Bunker. Find part 2 below and then buy your way through the gate at the back of the Operations Bunker. Head up the stairs and check the floor on your right by the boxes. If it's not there, follow the route upstairs and check the bunkbeds. The final possible location is even further upstairs. So continue following the route up another flight of wooden stairs to the room where Stamin-Up is. Check the plank by the windowsill. Location: Near to Jug / Operations Bunker. From spawn, go up the stairs in the department store, turn right and into the room where Jug is. The part may be in here on the table. If it's not, continue past Jug outside and down the stairs. Note the truck here and search the smaller truck with the blue barrels on the back. The final location for part 2 is inside the Operations Bunker. Go past the larger truck, through the doors and search the shelf inside the bunker room. Location: Near to Supply Depot / Amory. From the Stamin-Up room, buy your way across the bridge. Check the wall on your left after you cross over. If it's not there, follow the route downstairs and the part may be right in front on you on the wall. The final location for part 3 is even further downstairs. Follow the route down two flights of stairs to the Wunderfizz machine. The part may be on the wall to the left of the machine. Go to the dragon launch platform at Dragon Command. Walk up the left platform and face left at the end. Take note of the purple/pink writing on the wall. Shoot fire from the shield so that it hits the writing on the wall. Go to Supply Depot. Stand beside the Gigant Eye Beam trap, facing inside the depot and look up at the broken rafters in the roof. Shoot the symbol again using fire from the shield. Go to the War Factory. Walk up the dragon launch platform and face the giant robot which is lying half inside the building. Shoot the pink writing on his arm. Return to spawn and face the dead dragon (just on the edge of the area, not far from Gobble Gum). Exchange your shield for the upgraded version.